Beautiful matching Teapot Duo (Teapot and Tea Cup with Saucer) and Hat Box. 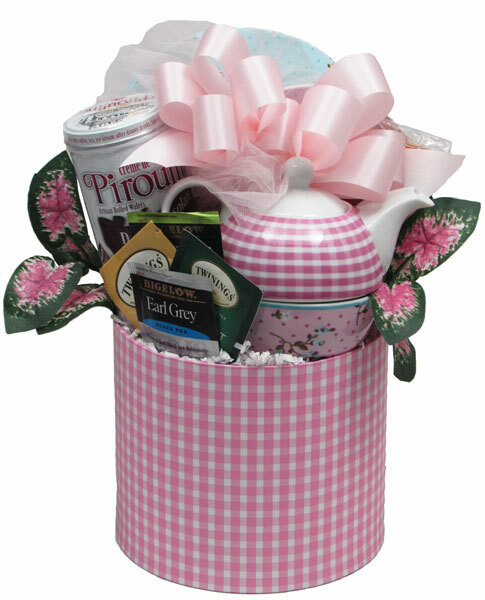 Also in the design is Pound Cake, Biscotti, Chocolate Cream filed Wafer Rolls, Chocolates, and Individually wrapped Tea Bags. Wrapped in Crisp Clear Cellophane and topped off with a big beautiful Handmade Bow. We've added silk leaves and/or flowers. Includes a Handwritten Greeting Card. Add balloons or plush animals to your design!